« When Is the Right Time, Speaker Ryan? In a service at the Unitarian Congregation of West Chester a few weeks ago, just before Yom Kippur, I spoke about the Jewish spiritual practice of teshuvah – turning in the heart. How do we turn, I asked, when the failings belong to all of society? Today those failings are more in evidence than ever. Women and others who report sexual assault continue to find themselves ignored, blamed, and belittled by privileged men in power. Children continue to be separated from their parents at the border, even when the children are United States Citizens and the parents legal asylum seekers. Evidence of global climate change and our failure to address it is greater than ever. In the pain of the news, I find myself coming back to the that service. Here are some of those words. “There is a natural instinct in the face of overwhelming grief to cover our eyes with our hands. When we’re mourning, we tend to turn away from what is giving us pain and find whatever is most comfortable. A friend, a prayer, a song, a comforting phrase, we find something, anything, to take us away from the agony of the moment. It makes sense that we would do this; it’s part of being human. We need to do this sometimes. As we grieve, eventually and slowly we allow ourselves to confront our sorrow, and we emerge wistful, perhaps wiser, certainly more empathetic. It is a healing process. “In the grief of global and societal injustice, we naturally turn away, because it is our human instinct to do so, and hard truths cause us pain. The spiritual practice of turning bids us to uncover our faces, open our eyes, and turn back towards the pain. “I want to ask us to turn and face realities we would not like to admit, to accept the leadership of those who are most directly affected by those realities, and to pray with our feet. I want to ask us to let go of whatever stands in the way of this work, to forgive ourselves and ask forgiveness whether we think we need to or not, to forgive others whether or not they have yet completed their own turning. I want us to look into our hearts, so filled with goodness and love, and remember why we care so much for other people, and this sacred earth. 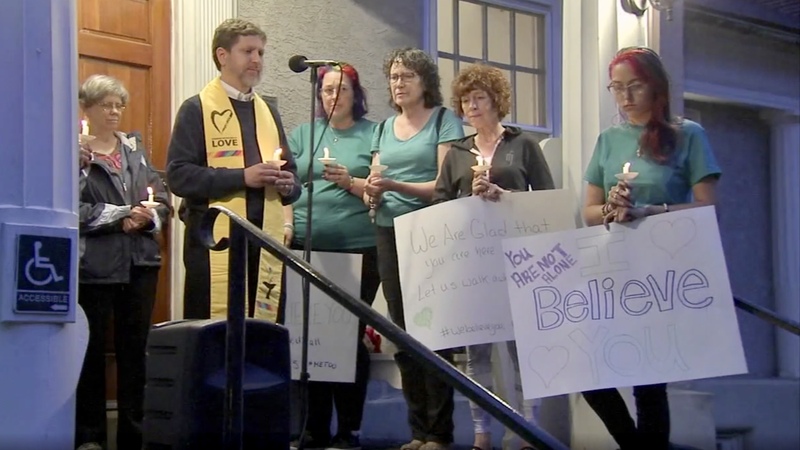 Members of the Unitarian Congregation of West Chester vigil in support of survivors of sexual assault. Yes, I believe, and will never stop working for the best of us.